Several studies have focused on identifying what obstacles, both real and perceived, clinicians face in conducting regular IPV screening. Sprague et al. conducted a meta-analysis of this research in 2012, identifying 22 studies that surveyed clinicians about barriers to IPV screening. The three most common barriers included time constraints (cited in 82 percent—or 18 out of 22—of the studies reviewed); lack of knowledge, education, or training on the issue (cited in 68 percent of studies); and inadequate follow-up resources and support staff (63 percent of studies). Clinicians also reported discomfort discussing IPV, concerns for their personal safety, and apprehension about misdiagnosis. Half of the reviewed studies reported that the health care provider feared invading their patients’ privacy or offending them. Several reviewed studies (46 percent) also reported that health care providers did not think it was their role to screen for IPV or felt that they had more pressing issues to address (Sprague et al., 2012). There is debate within the medical community over what the appropriate frequency and conditions of screening should be given clinicians’ limited time and resources. One question is whether asking about IPV should be done through a “case finding” approach or through universal screening (Wathen and McMillan, 2012). Case finding involves evaluating whether the patient has specific symptoms associated with IPV, such as cuts, bruises, or broken bones. It also considers whether something in the patient’s history or status indicates that she is at greater risk. For example, IPV occurs across socioeconomic statuses, but the risk is higher if the patient is from a lower socioeconomic status (Rennison and Welchans, 2000; U.S. Department of Justice, 2004) or has a history of drug or substance abuse (McCloskey et al., 2005). These physical symptoms or other warning signs would signal to the clinician that additional questioning about IPV may be necessary. These guidelines, recommending screening frequently, regardless of risk factors or warning signs, demonstrate a universal screening approach. 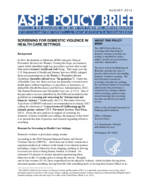 The USPSTF recommendation takes a modified universal screening approach, stating that all women should be screened regardless of risk factors, but it places an age restriction, limiting the recommendation to women of childbearing age, and does not specify in what conditions screening should occur. The IOM recommendation does not provide guidance on when and how often screening should occur or within which contexts. 4 From “The National Consensus Guidelines on Identifying and Responding to Domestic Violence Victimization in Health Care Settings” written by Futures Without Violence in 1999, and revised in 2004. The guidelines can be accessed at: http://www.futureswithoutviolence.org/userfiles/file/Consensus.pdf.